Native to India, leaves dull dark green, lighter undersides. White with yellow and red variegated fragrant flowers resembling snapdragons. 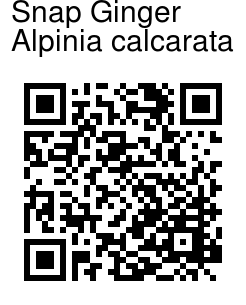 Alpinia calcarata is a very easy and vigorous species to grow. It has very narrow foliage and stems and is a prolific plant. 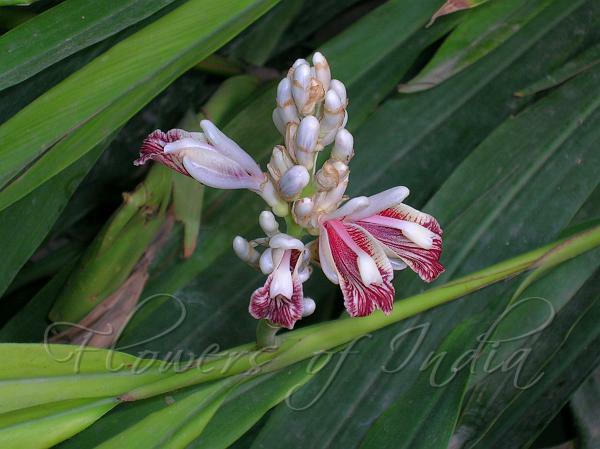 Its narrow habit is not nearly as attractive as many of the better foliage Alpinia. It will not bloom in Zone 8 despite its hardiness. The medium size white and red flowers are attractive and appear on upright inflorescences. It grows well in medium sun in well drained rich soil. Alpinia carcarata has nice reedy foliage but there is not much else going for it. If you live in a frost free area you will get some pretty flowers, but like other Alpinias, this will only bloom on second year growth. If the foliage freezes back it will not bloom the next year. Photographed in Lodhi Garden, New Delhi & Imphal, Manipur.